Implementing sound rubber stamp storage practices will help prolong the life of your stamps and storing rubber stamps correctly will ensure good reliable stamping results every time. A well organized stamp storage system will also help you find the perfect stamp every time without rummaging through boxes and draws. Every stamper will have their favored way of storing rubber stamps, however there are a few key requirements that are important to bear in mind which ever way rubber stamps are stored. Why Worry About Storing Stamps Correctly? Good question! And if you are just starting out there's probably not too much to worry about. However, once your rubber stamp collection starts growing (and it will!) you will need to ensure that you can find the right stamp for a project. Storing your stamps correctly will also ensure that the stamps do not become damaged and are always ready for use. Mounted stamps require a rubber stamp storage solution that allows them to be stored with the die side (the image) face down on a smooth surface. Prolonged resting on an uneven surface, for instance a surface with ridges, may cause permanent dints in a stamp and render it unusable. Do not stack too many stamps on top of each other. The weight of the stamps can damage the stamps at the bottom of the pile. Uneven edges will also result in the damage of the stamps as detailed above. 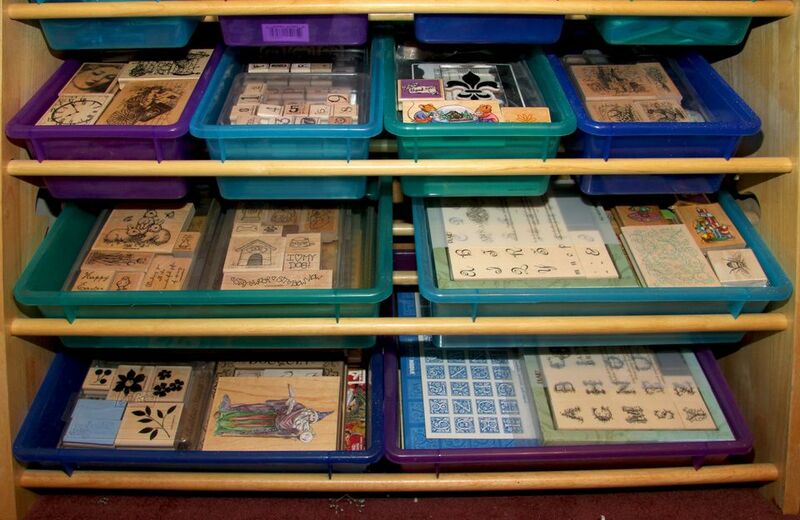 Consider a rubber stamp storage solution that allows you to store your big and heavy stamps at the bottom. Cardboad boxes can be good for storing mounted stamps. Just make sure that the box is strong enough to hold a number of stamps. You can use clean and unused pizza delivery boxes to store stamps, which are great because they stack and you can write on the side what each box contains. Keep rubber stamps away from sunlight. Direct sun onto a rubber stamp can damage the rubber and result in unreliable stamping results. Sunlight (and heat) will dry out the rubber and make it hard and brittle. It will also discolor acrylic stamps. Unmounted stamps are easier to store giving you a wider choice of rubber stamp storage systems. They can be attached to acetate, stored in folders (put clear inserts into the folder so you can see the stamps enclosed) or cd cases, kept in envelopes or safely filed in a number of places. However unmounted stamps are stored, it is important to ensure that they are lying flat. The stamps can easily get damaged if bent or twisted. Clear plastic boxes are a good place to store stamps (that is how I store mine). Label the outside so you can see which stamps are enclosed. Attaching clear stamps to acetate will help to keep them flat and also make them easier to find. Ensure that your rubber stamp storage system protects your stamps from dust. Storing rubber stamps correctly is particularly important for cling stamps, as dust can stop them from adhering to an acrylic block and making them difficult to use. Plastic folders and envelopes, cd cases and many other containers are ideal for storing stamps and keeping them away from dust and dirt. Also try to keep them away from direct light. Correctly storing rubber stamps will help prolong their life and ensure good reliable stamping results every time. A well organized rubber stamp storage system will also help you find the perfect stamp every time without rummaging through boxes and draws. Every stamper will have their favored way of storing stamps, however there are a few key requirements that are important to bear in mind which ever way stamps are stored. What Are Some Ways to Use Silk Paper in Crafting Projects? What is Craft Foam and How Do You Use It?